Have you been to the RFL Christmas Expo yet? No? Well, you better hurry! It ends tomorrow! I stumbled upon new-to-me store LIV-Glam while at the Expo yesterday, and I couldn’t resist the Amy trench coat! It’s a real steal at only $99L and comes with a HUD so you can change your coat into one of thirteen colors. There is also a special colored trench that is just for RFL that you can buy separately. I think it’s very cute, although I wish the inside was not transparent. In certain poses, you can really tell the transparency. [Look at my left wrist to see what I mean.] But for such a cute and affordable coat, trust me, I’ll let it slide! 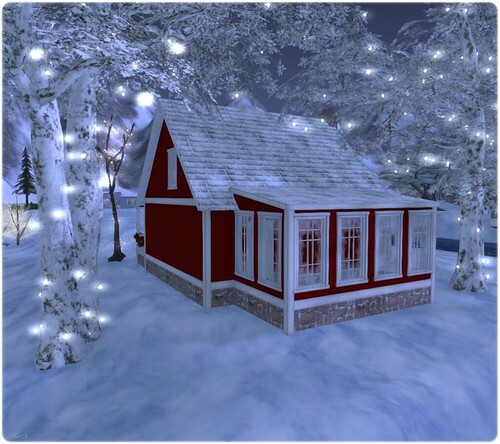 The RFL Christmas Expo ends tomorrow, December 19th, so scoot on over and check it out! If you haven’t heard, an awesome fundraiser is going to be held for Second Lifer Sway Dench. You all might know Sway from the cuteness she creates – like cookie bears! You can read up on why the event is being held over here on the Together For Sway blog. Updated: Here is the SLurl for the event! Over 50 of SL’s best designers are taking part in this awesome event, including Funky Junk! The Noelle house is just about as cute and Christmassy as they come! It’s a small home with a large living area, a smaller downstairs room, and a spacious upstairs loft area. There is also a great back sun room! Together For Sway starts on December 15th and I’ll update this post with the SLurl when the event starts. Be sure to shop, get some awesome stuff, and help out one of our own! See you there! Together For Sway event location! Quiet day for me today. I’m really just waiting for the morning. Couple of events to tell you about: The Unhinged event kicked off today and there are a lot of great designers involved. This event is a charity fundraiser for Second Lifer Eku Zhong. I don’t know Eku myself, but when so many people are willing to help you out, you’ve got to be a pretty special person. You can read all about the event on this page. FAIR starts on November 17th, and as usual, it’s going to be fantastic! Lots of great items and I’ll definitely been showing you guys more from the event after it opens. Fashion For Life starts today at noon!! I’ve been in pink girly heaven with this gown from My Precious by Agnes Finney called Forever Yours. I don’t wear a lot of gowns, but THIS one…WOW! So very impressed! It’s like walking springtime, and being this lovely shade of pink, you know I’m very happy to float around in it. I’m not sure which sim My Precious is on for FFL [I know, bad blogger!] but I’ll update this when I get the SLurl. But truly, you should walk around FFL anyway because there’s some wonderful stuff out there! One of my favorite times of the year is about to start! Fashion For Life starts on the 10th, and that marks the annual start of the official ‘Relay for Life’ events that take place inworld each year. I love it because you can always pick up some great things for charity, like this Adorabelle angel outfit from Angelwing! This outfit is really something! 20 pieces and lots of great prim work! The staff even has a pose in it. It’s not something I’d wear every day, obviously, but it is certainly impressive if you need something for photos or even if you’re RPing an angel. Loves it! Fashion For Life starts on March 10th and is 10 sims full of great designers all working together to support the American Cancer Society. Did you hear? The Skin & Shape Expo opened todayyyy!!! Are you excited?? Although I’m not as big of a skin whore as some people who shall remain nameless, I do love a good skin. I don’t normally buy shapes, but there are some really lovely ones out there, too. Let’s see three of my favorite finds [so far!] from this year’s expo! From Belleza, the ADORABLE Aiko skin! How sweet is that face? It’s more of an Asian style skin, so I changed up my shape a little to reflect that, and I just love it! There are 15 makeups to choose from, plus lipsticks! Amacci has some full avatars this year, and this is the skin, shape, and hair from the Kiara avatar. So pretty! The full avatar package is truly a great deal because you get the Katie skin, different sized shapes, the Emilia hair, eyebrow bases, eyes, cleavage tats, and lingerie. And what skin fair is complete without Curio? The new May skin is just so lovely! I’m wearing this on my own regular shape and I just adore it! There are 12 makeups and of course the Megapack is a real bargain because you get alllll the skin tones and makeups. The only thing that would make this even better in my eyes is if there were blonde eyebrows! Please, Gala? PLEASE??? Get yourselves over to the Skin & Shape Expo NOW!!! Culture Shock opens on May 1st and it is already promising to be one incredible event! Over 150 of Second Life’s most awesome creators are joining up to raise money for Doctors Without Borders, and each store has a mandatory minimum of 3 new and exclusive items each – contributing 50 – 100% of their profit to DWB. Today’s sneak preview comes from Ibizarre with the Marissa dress. Culture Shock starts this Sunday, May 1st, and is brought you by CHIC Management and sponsored by Modavia Productions. Sometimes you don’t want to be classy or high fashion or anything except for cute! Luckily, that’s super easy to do in Second Life – especially lately! Have you been to Project Fur Japan yet? No? WHY??? I picked up this Rabbit Stamp shirt from Ange at Project Fur, and I just love it! [This SLurl should take you directly to the vendor.] It comes with 2 colors in the pack and is only $50L, so really, it’s a heck of deal for so much cute. Yesterday, I got this Andrea Head Decor from SoliDea Little Folies and I thought it went perfectly with my hair! I did have to mod it a little to fit my weird shaped head, but sunflowers are pretty much my favorite flower ever, so it was worth it! I’m heading off to go bounce around and be cute! You guys go be cute too! Front Row started yesterday!! Have you started hitting up some of the stores yet? No? Why not?? Front Row is an event that benefits Relay For Life, and oh, what amazing designs there are! I was so happy to see one of my favorite stores, Jane, taking part in it! The Anna dress is just so sweet. Of course, I could say that about any of Janie’s designs, but just look at it! A daisy printed skirt combined with a little printed tank and topped off with a slim leather belt? How could you NOT love it? And don’t forget that 100% of the proceeds of this dress go to Relay For Life! Pretty dress for a good cause? Sign me up! Head over to Jane to pick this up, or go this page to see other designers taking place in this event. Here is another treat from the Glance Front Row event coming up tomorrow, April 1st. This lovely little dress is from Vanitas Vesture. This ladylike dress is called Obsessive, and I have been obsessed with strutting around my house in it! The style is simple, but the print is what really brings out the beauty in the lines. The Front Row event takes us on a fashion tour of 50 of Second Life’s best designers. 100% of the proceeds of all of the Front Row items go to Relay For Life. Pretty stuff and a good cause? Heck yes!